Four weeks ago, we said our good-byes after commemorating the 43rd anniversary of the event that shaped each of us in some way. I know that many of you feel as I do; each time we get together we learn something new or different about the operation. I hope everyone realizes the tremendous amount of work required to make our reunions special. This reunion would not have happened without the efforts of Al and Tina Bailey and many others. I am always amazed that our events seem to happen without difficulty, but this is because special people worked to ensure that our reunions focus on what is most important - being together. Thanks to those who arranged the trip to the Naval Museum, the photo taken in front of Knife 22, and the fishing and golf outings. You may not know that Dan Hoffman did much of the behind-the-scenes work. Dan gathered auction items, submitted reunion dates to military magazines, ensured special recognition for people who have given above and beyond, obtained the plaques, awards and challenge coins, and stocked the booze and beverages for the bar. Dan, you are a special person. Thank you for your hard work and dedication. Don and Becky Raatz gave attendees the personalized gift bags that were such a big hit. Al Mahan and Tim Trebil took it upon themselves to give each veteran a special “Koh Tang” coffee mug! Bobby Hines, who served in VA-94 on board Coral Sea during the Koh Tang operation, made and donated the “Fat boys Luthier Shoppe” guitar. A huge thanks to each of these special folks. All of us were captivated by Clark Wiger’s drawing of “The Angry Eagle”. Clark’s story of this moving piece of artwork will be in the KTMV Organization newsletter. Saying “thank you” falls short for such a moving description of “The Angry Eagle”. A special thank you to Kelly Fowler for buying the copy of “The Angry Eagle” we all signed. A very special thanks to Terry and Kathy Brooks for driving Terry’s rolling tribute all the way from Oregon! Their magnificent vehicle graphically displays to all of America the battle of Koh Tang. We are forever grateful to all these special people, including those who washed Tina’s huge pots in the tiny sink in our hooch! To fulfill the first article of our chapter bylaws, we must try to contact every person who was involved with the Battle of Koh Tang and the recovery of the SS Mayaguez. Through the efforts of several members, more of our brothers have been located during the last two years. I encourage each of you to locate those not found and reach out to those who are reluctant to join our organization. We are all still brothers. I am excited to be president of one of the most closely-knit organizations that any veteran could ask to be a part of. With your help and support, we can make it an organization that is second to none. As I start this endeavor as your president, I would be remis if I did not acknowledge the outstanding leadership and guidance that Don Raatz has provided over the past two years. He is the consummate professional who was not afraid to make hard decisions. Outstanding job, Don! Thank you so much for your hard work and dedication. As we look to the future I hope we all realize that we have a very special organization. There is no closer bond than those who have experienced combat and faced death together. As your president, I promise you that I will do my best to address (and hopefully solve) any problems we may have. My father taught me to confront a problem head-on instead of pretending it doesn’t exist. In both the military and business worlds, I learned that it is best to attack the most pressing problem first. That said, it is no secret that we have had some friction in the organization. Most organizations have similar difficulties. Problems often arise when a person says something negative about someone to a third party. The third party will most likely take sides and tell at least two others. Now guess what happens if one of those people puts that negative comment on Facebook or some other electronic media. In my opinion, no problem ever gets solved on Facebook. As my father used to say, “If you have an issue with someone, then go to that person in private and make every attempt to work it out.” If you have wronged someone, swallow your pride and apologize. If you are unable or unwilling to work things out, then agree to disagree and don’t let it affect others. My prayer is that we can all put aside any differences and enjoy the comradery and friendships for the rest of our lives. Let’s take care of each other like we did our best to do over 43 years ago. Keep in mind that we are losing brothers at the rate of 2 per year; that number is only going to increase. On a personal note, as many of you know, I was very close to Dan Darden. For over three years he and I talked often and enjoyed many things together. However, we did not think alike and were miles apart on politics, the direction of the KTMVO, and many other topics. Despite the differences, we loved each other very much. When he died I felt that I lost part of myself. If you have a problem with a brother, agree to disagree while showing respect for each other. Attached is a cover page for our up-coming newsletter. Please send Tina your picture(s) from the reunion either by e-mail or SIM card. What makes a great newsletter is input from its members. This is an OFFICIAL request from Tina for you to contribute a few lines or an article. My contact information: Email: tnoble68@outlook.com Phone(s) Home: (812) 636-9277. Cell (812) 296-0387. I do not carry my cell phone most of the time, but if you leave me a message I will return your call. Posted 5/22/17 As we approach May 15, 2017, the 42nd anniversary of the Battle of Koh Tang, we find the Koh Tang / Mayaguez Veterans Organization in as sound as it has ever been. I’ll bet even Larry Barnett could hardly believe how far we have come. It would not have been possible without his initiative, nor, the tireless efforts put forth by the office holders and members of the board of directors over the years. We have contributed what we could so that the future leaders can eventually benefit from our efforts. This brings me to the point of this short piece, WE WANT YOU to consider a leadership position in our group. In a year’s time we’ll be voting on those who will replace the current leadership and it’s not too early to begin thinking about stepping up and making a contribution. It matters not what part you played in the operation. It only matters that you are a member and care enough about our brotherhood to pitch in a little time and make it better. So sometime between now and our reunion in May 2018, contemplate what you can do to advance our group. Please consider throwing your hat in the ring. New leadership is always rejuvenating and new ideas can only make us stronger. 1. REPATRIATION – With the authorization of the Board of Directors, we have offered a reward for information leading to the discovery and repatriation of the remains of any US servicemen who did not return from the Battle of Koh Tang. This has been done on several fronts. Specifically, there has been an attempt at outreach to Em Son (the commander of forces on Koh Tang), Meas Muth (Son’s Khmer Commander suspected of initiating the seizure of the Mayaguez, who is currently being tried by a War Crimes Tribunal for actions he took during the Pol Pot regime), and the Phnom Penh Post newspaper. After almost 42 years, assessing the probability of success is difficult at best, but we will pursue any reasonable lead which could bring our Brothers home. 2. NEWSWEEK ARTICLE – Matt Burke, a correspondent for Stars and Stripes, has penned an article with new information about the battle of Koh Tang which was published 1/24/17 in Newsweek magazine. For those who don’t know Matt, he has been a tireless advocate for keeping our story alive. He returned to Koh Tang in May 2016 when several of us revisited the site of the battle. There has been much discussion among the Board and others concerning the facts and conclusions contained in the article. As Bob Blough aptly noted, “we all know that our memories of traumatic events can evolve over 40 years, especially if we've experienced survivor's guilt or PTSD.” Without realizing it, sometimes beliefs can morph into facts over time, further obscuring what really happened. Not saying this happened in this case, just making the observation that it is something we all need to acknowledge and be aware of. For those who have not read the article, please do so and draw your own conclusions. 3. VIETNAM SERVICE MEDAL – It has been a lingering slight that those who participated in the Mayaguez Operation have been denied the right to wear the VSM for over 40 years. For whatever reason, the time frame to be eligible to receive the medal ended 30 April, 1975, just days before the May 12 seizure of the Mayaguez and the final battle on May 15. The overwhelming case in favor of its award includes the fact that the names of our brothers who perished appear on the Vietnam Veteran’s Memorial in Washington DC; the Mayaguez incident is generally acknowledged as the last battle of the Vietnam War; the Mayaguez was cited as carrying military cargo from the Republic of Vietnam; the memorial located in the halls of the Pentagon in Washington DC include and includes the Mayaguez incident as part of the Vietnam War, and the list goes on. Ric Hunter, a USAF F-4 pilot who participated in the operation, has successfully lobbied his congressman, Mark Meadows, to introduce a VSM Mayaguez bill in the US Congress. We are in the process of obtaining the support of other lawmakers in hopes of its eventual passage. 4. F.O.I.A. REQUEST – A Freedom of Information Act Request was submitted to the Central Intelligence Agency (three times!) requesting all documents pertaining to the seizure and recovery of the Mayaguez. Our request was finally acknowledged on January 31, 2017 and is currently being acted upon. Perhaps this information may serve to fill in some of the blanks, answer some of the lingering questions about all the actions taken and decisions made. We will hopefully receive these documents prior to our next reunion. 5. LEAFLET – Jim Butler, 2nd Class Lithographer aboard the Coral Sea contacted me with information I had not seen before. As he put it in an email, “The Admiral in charge of the operation onboard Coral Sea ordered 10,000 leaflets printed immediately. The leaflets were printed on heavy card stock, with French on one side, and Cambodian on the other. Shortly after completing this, the Admiral called us directly, ordering us to destroy the plates, negatives, and all 10,000 leaflets. We complied and destroyed 9,996, keep 4 for posterity. We had no clue at the time what was on the leaflets, but the destruction of them, was part of the cover‐up of the Marines left behind.” I’m having Fred put a copy of the document, as well as its translation, on the website for all to see. 2018 REUNION VENUE – Due to many logistical and other reasons, the location of the 2018 reunion has been moved from Pensacola to Ft. Walton Beach. Al and Tina Bailey have done extensive research and concluded that the Ramada Plaza Beach Resort in Ft. Walton Beach can best accommodate our needs. The dates are May 13-18, 2018. Posted June 12th 2016 . As we depart Cincinnati from our reunion marking the 41st anniversary of the Battle of Koh Tang, I’m reminded that these events require enormous effort. Once again, Al and Tina Bailey deserve great credit for their tireless work in organizing the convention. Gatherings Plus did a fabulous job of choosing and scheduling our entertainment. The tour of Cincinnati, the River cruise, and the excursion to Wright Patterson AFB to visit the Air Force Museum and the Mayaguez exhibit were all interesting and memorable experiences! Finally, a gigantic thanks to Mr. Gary Sinise for his part in honoring and supporting us and making this group of veterans feel very special. He is a genuine patriot and a great American. 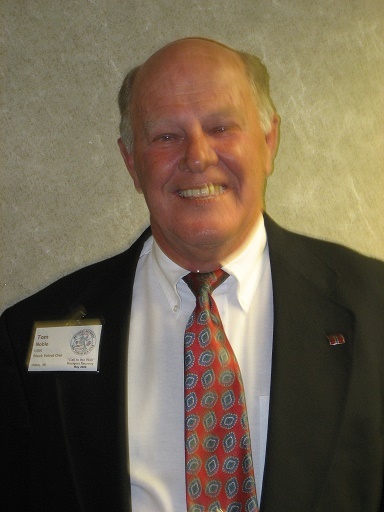 Tom Noble deserves praise for rounding up the many sailors from the Harold E. Holt and the Henry B. Wilson and inviting them to attend this year’s reunion. Their contribution to the safe return of the SS Mayaguez and its crew are as important as any who participated. From those who refueled the warplanes to the engine room crews, all deserve credit for the successful outcome of the operation. I think all would agree, this year’s mission debrief was among the most moving and varied as any we have had. Of particular interest was the Navy’s perspective of the operation. Many of us have waited 41 years to hear their experiences. Especially William Polly recounting the marshaling in of Bob Blough’s HH-53 to the Holt’s postage stamp deck, in the dark! And the effort Tom Rieter made to spin up the Henry B. Wilson’s engines to max speed to hasten their arrival on scene from a position half way to Australia. These are just two of the unsung heroes among the many who participated. As those who attended are aware, we have received tax exempt status by the Internal Revenue Service under section 501(c)(19) of the Internal Revenue Code. This simply means that any contributions made to the organization will be tax deductible to the donor. Fred Morris deserves credit for initiating this effort long ago which has now come to fruition. Many thanks are due Jeff Steffen of Hutchison and Steffen Attorneys for his tireless efforts in wading through the myriad of paperwork involved in its successful completion. Since we have received our tax exempt status in late January, we have been blessed to receive contributions of more than $7,000, including $3,000 from wonderful people and true patriots, Terry and Cheryl Holden as well as a $2,000 anonymous donation. Thanks also to Tom Rieter, Alex Wright, and Lore Guilmartin for making generous contributions of $500 each. I intend to continue the fundraising efforts in the next 24 months so that we may have the resources necessary to achieve our goals. 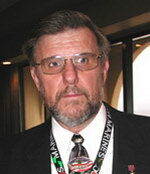 Al Bailey is the organizations president. 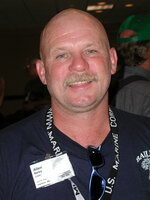 He was elected the president in May of 2012 at our 37th Anniversary by the members. If anyone wishes to contact Al please go to the contact us page and you can get his phone number, his address and or his email address. 10/26/12 Al's first President message is ready! To read Al's message Click here. This is a .pdf file and takes a moment to load. Give you web browser permission to load if necessary. 10/26/12 This is the corrected Board of Directors list. Click here. The below pages are from the past president of the organization. It is with profound sadness that I inform you of the untimely passing of Lt. Col James H. Davis who was of course the Golf Company Commander on Koh Tang. His unexpected death at age 68 is a severe loss to our organization. Jim, who will always be Captain Davis to most of us, was a guest speaker at our reunion in Washington, DC, and always had time for his fellow veterans. Our brothers Tim Trebil and Al Bailey were able to represent our organization at Jim's funeral. Other Koh Tang veterans including Joe McMenamin and Mike Cicere, were also in attendance. A large floral arrangement was provided by the Koh Tang/Mayaguez Veterans Organization. I have asked webmaster Larry Barnett to provide a link to Captain Davis' obituary on our webpage. Rest is Peace Captain Davis. 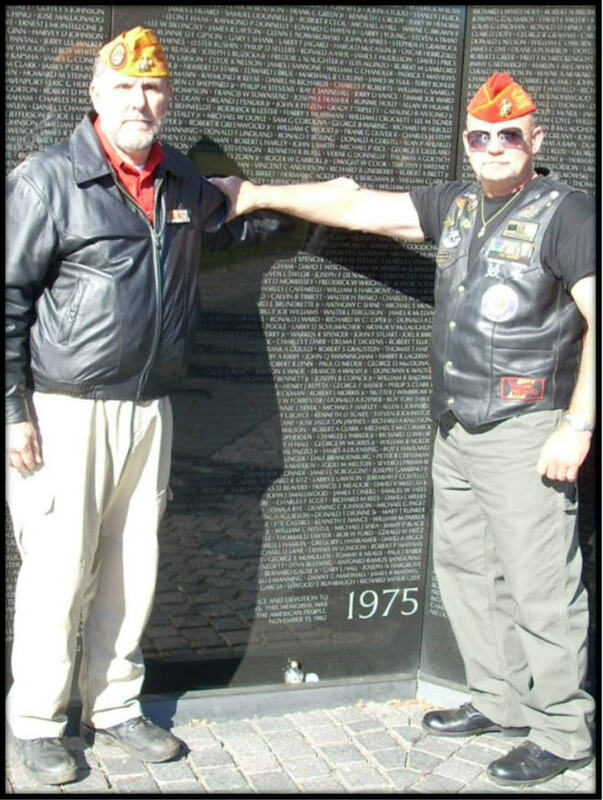 After a long and difficult battle we have also lost Eddie E.J. Oswalt to leukemia and the effects of Agent Orange. E. J. was on Black Velvet One and was an active and early participant in our organization. He will be sorely missed. I am also sad to report that because of health reasons, our secretary, Edd Prothro, has asked to resign. I have asked Paul Bussiere to act as our secretary until we hold elections at our upcoming reunion. We thank Edd for his service and wish him well. Let me mention here that we need several more of our members to step up and offer their services. If you are interested in running for any of our elected offices or to volunteer to serve in any capacity, please contact Larry Barnett who is the election chairman this year. Plans for our upcoming 37th Anniversary Reunion May 16 to 20, in Branson, Missouri are well underway. Based upon feedback, I anticipate we will have close to 100 veterans of our battle there. Your officers and board members, but especially Al and Tina Bailey, have been doing a tremendous job to make this year's reunion our best ever. The untimely passing of Jim Davis, exemplifies the fact that we are not getting any younger. Please do all you can to attend this year's reunion. Those who have been with us for past reunions can tell you how very special our times together are. If you are sitting on the fence, debating about whether to attend, I would stress that it is a very rewarding experience and you should make every effort to attend, if at all possible. One of our scheduled events is an Open Forum/Timeline/Mission Breakdown. We go through the entire operation, in chronological order, event by event and have everyone, if they so choose, share their recollections of that eventful day. For many it is a huge learning experience with the details of the operation being explained. With the group participation, it is also a very emotional experience as we relive the events. As one who suffers with PTSD, and most of us do, it is also a very therapeutic and positive experience. Many of those who participated in this at our last reunion identified it as the highlight of the weekend. As in the past we will have a Fund Raising Auction and Raffle. If you can, please provide an item or two that we can use to help offset the cost of our reunion, and our other expenses. Perhaps something of value from your company or organization or something representing you, or where you live. As an example Rich Zales who has an avocado farm in California, previously sent a case of his fine avocados. Even items such as gift cards will be graciously accepted. With the exception of our bi-annual Golf Tournament, which Tom Noble has so successfully carried out, this auction/raffle will be our primary fund raiser for the year. If you cannot be with us, please consider sending something for the auction/raffle. Contact any of the officers or board members if there is something you can donate to our cause. Recently I came across a magnificent artist's print of the Mayaguez by artist Ian Hall. Check out soldiercity.com and go to Art Print's and type in keyword Mayaguez. In the past we have had a difficult time finding a full broadside image of the ship. This is a really beautiful rendition. We will have two of these prints available at the reunion. They will be nicely framed and matted and it is my intention to have all reunion attendees sign the matting on the prints. One print will go up for auction and one will be the grand prize in the raffle. If you wish to order your own print, as I have done, or if you have any additional items such as books or prints you would liked signed, we will arrange a special time at the reunion for everyone to sign them. Ideally these prints will be brought back to future reunions and eventually have a large number of our signatures on them. One more item of great importance; your officers and board have been pursuing several new leads and have taken actions we hope will have JPAC return to Koh Tang in the near future to search for remains. I intend to have significant new information to present to our members at our upcoming reunion. This letter has become a long one but we had much to share. Everything you need to know about our reunion is available on our web site. I will have one more Presidents Letter here on our website on May 1st, just prior to our reunion with last minute details and information. Of course call me anytime if you have any questions or concerns. Happy Veterans Day to all the MAYAGUEZ / Koh Tang Veterans and Happy 236th Marine Corps Birthday to all who were in the Marine Corps. Good things to report on our organization. The sales of James Wise and Scott Baron's book have been excellent. It is of course still available on Amazon.com and other websites. Scott identifies he plans to be at our upcoming reunion in Branson in May. Everything you need to know about our reunion is available elsewhere on our website thanks to the hard work of Tina and Al Bailey. Things are progressing for a MAYAGUEZ/Koh Tang display in the expanding National Museum of the Marine Corps in Quantico, VA. Plans are underway for a display that will include the ships bell and the large wooden carving presented to us by Ray Porter that identifies all the Marines from Delta 1/4 that boarded the MAYAGUEZ. Several other items captured on the Island will also be included depending on space. I will keep you informed on the timetable for this display. If anyone has items you think the museum might be interested in please contact me. 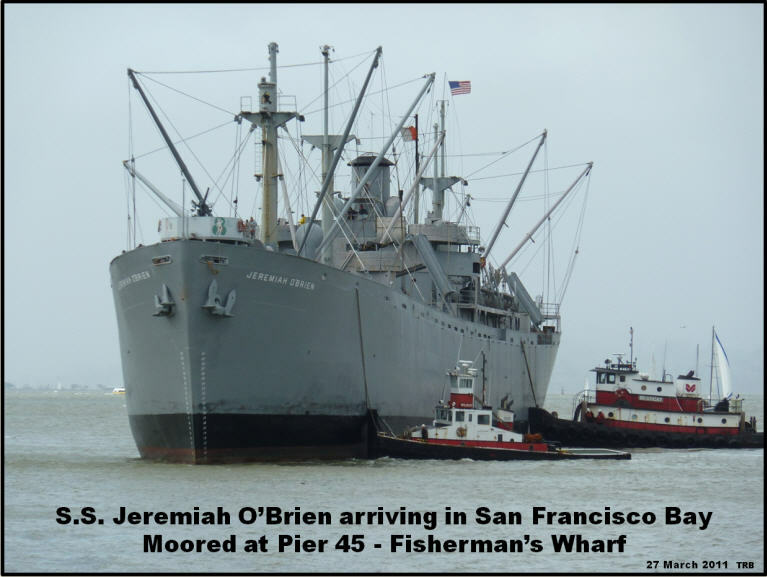 The Mayaguez captains bunk and desk are now aboard the S.S. Jerimiah O'Brein floating museum in San Francisco harbor. The desk is being utilized and the display for the bunk is still in the planning stages. At our upcoming reunion, I would suggest that we need to discuss purchasing a plaque for the ship to identify our operation and information on the MAYAGUEZ. One of the primary goals of our organization and part of our mission statement was to keep the events of the MAYAGUEZ and the Battle on Koh Tang in the public eye. To ensure that our story does not fade away and to do all that can be done to recover the remains of those left behind. Your officers and board of directors continue to be involved in this and we hope to have more information available to you soon. Please make plans now to attend our upcoming reunion in Branson, MO in May. Each year more veterans have attended and we expect to have more than 100 this year. One item on the agenda will be the election of new officers. I will be stepping down as president. I have asked Larry Barnett to head up an election committee and present a slate of officers. Nominations will also be taken from the floor. If you are interested in serving as an officer please contact Larry. We continue to assist veterans in getting or increasing their VA benefits. As always if there is anything I can do to help, please call. One of our own is hurting. Fred Morris's wife Ellen is having some medical problems right now. Please keep them in your thoughts and prayers. Best Wishes for the upcoming holiday season, Hope to see you in May. We all had a fantastic time at our recent summer camp out and reunion in Odon, Indiana. Rather than duplicate information I would direct you to several other postings on this website for more detailed information on our many activities and events, especially an excellent after action report by our webmaster and founder Larry Barnett which is posted below these comments. Also please checkout the minutes from our meeting and our VFW meeting. I also have asked Larry to post a copy of a thank you letter I sent to the Odon Journal on behalf of our organization. With all that to review I must still make a few comments. We had a busy schedule for the week but some of the best times were the camaraderie we had around the campfires at night. Paul Bussiere from Echo Company joined us for the first time and quickly became a new friend. Tuesday was a special day with the dedication of Tom Noble's new truck and riding in our float in the Old Settler's Parade. Our auction and Golf Tournament were the best ever and we raised record funds. Words cannot express the gratitude and appreciation we have for Tom and Shelba Noble, their family and friends, and the special town of Odon Indiana. I also would like to thank our officers and board members for all their hard work but especially Al and Tina Bailey, and Fred Morris, Dan Darden, Larry Barnet, and Al Mahan, for their contributions and hard work which made our week in Indiana this year such a success. Plans are already underway for our May 2012 Reunion in Branson, MO. It is only nine months away. More information will be posted on this website but please do all you can to join us there. Sharon and I got back from Odon last week and I had to get back to work so I could get a vacation. Once again the town Of Odon pulled out all the stops and an awesome time was had by everyone. Every time I go there I am amazed by the heart of this community. On Sunday the group honored a local Veteran Adam Trueblood. On behalf of the group Corporal Trueblood was presented a plaque honoring his service to our nation. Corporal Trueblood is an Afghanistan Combat Veteran and was redeployed two days later. This organization is proud to support Adam as he held the same standard that each of us did so many years ago. Check out the local newspaper article about him a copy is in this newsletter. This last year Tom had been keeping a big secret from all of us. Wild horses, Makers Mark & me couldn't get it out of him. Not knowing was driving me nuts. Our event itinerary shows that there was to be a Dedication Ceremony after decorating the float (awarded Best Theme Float) for the parade.. The question of the week was, what in the world is he dedicating on Tuesday??? The emceed was Mark Moreland. Lonnie Goen then gave the opening prayer. Scott Noble sang the Star Spangled Banner. THAT MAN CAN SING!!! Lonnie Goen then read a poem he wrote titled "Valor on Koh Tang" (in newsletter). Then it was Tom's turn to speak, he began by letting us know how much he loved all of us and what we had meant to him and Shelba over the years. He wanted to do something special for the Koh Tang Mayaguez Vets. Now if you have never heard Tom do public speaking then you are missing a real treat. The uniform of the day was tears. At the conclusion of Tom's speech I caught out of the corner of my eye a pickup truck being escorted into the driveway by the Odon police. EVERYBODY went "eyes right." Tom had bought a GMC pickup and restored it to honor all of us. This truck brings new meaning to "A Labor of Love." The ceremony ended when Wilma Goen sang "God Bless the USA" and brought everyone to their feet cheering. Tom pulled the our float that evening in the 126h Old Settlers Parade with all of us in it. On Wednesday we all hung out at Boggs Lake. Tom brought his boat, plus friends brought a party pontoon and a ski boat. That evening we sat around the campfire swapping stories and I got to make the group some of my world famous homemade (That's right Fred Homemade :)) chicken noodle soup. Dan Hoffman gave me the honor of the first Crown Royal toast. Things were kind of fuzzy after that. On Friday we held a VFW and an Organization meeting at Tom's house. The minutes from this are in this newsletter. That evening Tom led a fund raiser auction that was an astounding success. All of the proceeds went to our group. On Saturday after visiting Dr. Bloody Mary the Koh Tang Golf Scramble was underway. I only lost six golf balls and yelled FFOORREE three times. I think that's a record for me. Thanks to Fred Morris's short game and Justin and Travis's drivers our team shot a four under. Oh yea during that week I got my first Birdie. AND I had three witnesses. All of the proceeds from the Golf Scramble went to the organization. Friends as you can imagine so much work goes into making these gatherings special for each of us. The support of all of our wives and families make this one week a year special every year. Each of you are our unsung heroes. If you want to see patriotism at its best visit Odon, IN. Tell them we sent you. Another May has come and gone yet again. The month of May is always a difficult time for me and I'm sure no doubt for you. Reflecting on our operation and all the events surrounding Memorial Day makes it a very exceptional and emotional time of year. You are all in my thoughts and prayers. We especially remember those who were left behind and have not yet returned. 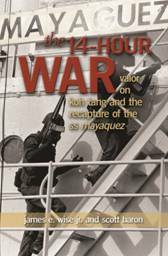 We anxiously wait for the release of James E. Wise, Jr. and Scott Baron's newest book, "The 14 Hour War": Valor on Koh Tang and the Recapture of the SS Mayaguez, published by the Naval Institute Press. By the time you read this message it will be available in the book stores. It has over twenty first-person accounts by Marine, Navy, Air Force and Coast Guard personnel relating where they were and what they did during the fierce engagement on Koh Tang Island. We are also counting the days to our annual summer campout gathering and golf tournament in Odon, Indiana this July 30th-August 7. This is a fantastic time; Odon the town will be having their 126th Old Settlers Festival which includes a parade, live music and carnival rides. Camping at West Boggs Lake is totally optional there are hotels nearby. Check out the flyer on the web site for more information in making your reservations to join in on the fun. Saturday, August 6th, is our 3rd Annual Koh Tang Veterans Golf Scramble. I've been hearing from many, I don't golf, that is not what this is all about. The golf scramble is the KTMV Org. major fund raiser for the Ronnie Hughes Fund. This fund has helped over a dozen of our fellow brothers along with their spouse attend a reunion or help with a past due bill or two. So, come on out to Indiana and join in the fellowship and fun. If unable to attend donations are welcomed and appreciated. Send donations to â€“ Koh Tang Veterans c/o Tom Nobel 203 North Grove St, Odon, IN 47562. Look forward to seeing you in Indiana. I will report back after the campout gathering and our meeting. As always, call me if you need me. Let me start off with some great news: The Captains bunk and desk from the S. S. MAYAGUEZ has found a suitable, permanent home. We are very pleased to announce that a display is under construction on the Liberty Ship Museum, the S. S. Jeremiah O'Brien, at Fisherman's Wharf in San Francisco Harbor. The MAYAGUEZ was originally laid down in 1944 and launched as the S. S. WHITE FALCON, so the bunk and desk date to that period. As you know, we explored a number of options. While the O'Brien is not our first choice, we've decided that it is the best choice at this time. Jerry Cople, formerly of Sea Land Corporation, has housed and protected the bunk and desk for many years. We thank him for his donation and his concern for ensuring that the items will be properly cared for and displayed for decades to come. I have spoken to the director of the museum and his staff to ensure that with this permanent display, the story of our battle and the names of those lost will be honored and preserved. For now, check out the museum's excellent website at http://www.ssjeremiahobrien.org I have asked Fred Morris to provide a link on our website. The O'Brien already has our site as a link on their website. I recently went to the VA Regional Hospital in Atlanta for a new glass eye and was very pleasantly surprised to see a huge permanent display there on the Viet Nam Veterans Memorial Wall. The hospital has a reproduction down a large hallway with replicas of each panel in DC. They also have several large photographs and a description of the last names on the wall, noting the Koh Tang MAYAGUEZ Operation. I hope to have several photos on our website soon. It is great to see that our story is getting out there for the public to see and remember. If anyone is aware of any other displays such as this, please bring them to our attention so we may share them with our members. Scott Baron's and James Wise's new book "Valor on Koh Tang and the Recovery of the MAYAGUEZ" is set for publication in the next 60 days. I have seen portions of an advance copy. It is a fabulous book. Many of our members provided significant input. The book is the first publication to look at the events from the perspective of the participants, particularly the Marines on the ground. It is a well researched and accurate work, so as soon as the book is available we will let you know how to obtain a copy. We all should be very proud of this book and the hard work done by Scott and James. The Jolly Green Giant Organization will be holding their annual reunion April 29 and 30 in Fort Walton Beach, FL. Of course, several of our members are Jolly Greens. Starting in 2002 we started our organization by piggy backing our meetings with the Jollys' reunions. For that we are in their debt. It goes without saying they are heroes; most of us owe our lives to the Knives and Jollys. Check out their link on our website. If you can, join them in Fort Walton Beach this year. Big plans are underway in Odon, Indiana for our Summer Campout and Golf Tournament. Tom and Shelba Noble are working hard to put this together. Check out the link elsewhere on this site and please do all you can to attend. I will be placing "In search of" announcements in many of the veterans' magazines soon to continue to expand our membership. Finally, I am pleased to report that I've been able to help many of our guys with PTSD and Veteran's Benefits. I am always here if you need me. And, as always, special thanks to our officers, directors, and their wives for all they continue to do for our organization. As I write these comments, the Christmas and New Year season is upon us. Peace, Joy, and Happiness to you all. In November, my wife Betty and I, along with Al and Tina Bailey, were honored to represent our organization at the L/Cpl Gregory S. Copenhaver Marine Corps League Detachment. A prayer was offered at his grave site, with his mother, some of his lifelong friends, and members of the Detachment attending. Al placed one of our 2010 Challenge Coins there permanently and we left a ceremonial bottle of Crown Royal on his grave stone. Photographs are in the 2010 Winter Newsletter. I also had the honor and privilege to be the guest speaker for the Detachment's Birthday Ball. It was attended by several of our departed brother's relatives and friends. Al and I shared a short history of our operation and L/Cpl Copenhaver's part in it, providing details most there were unfamiliar with. It was a very emotional and rewarding experience. Brothers, know that in Elkton, Maryland the memory of one of our lost comrades lives on. L/Cpl Gregory S. Copenhaver will be recognized, always remembered, and celebrated through this Marine Corps League Detachment. 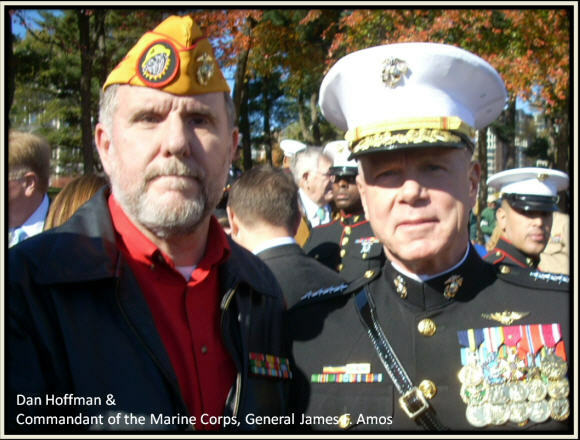 At the Iwo Jima Memorial annual wreath laying ceremony on November 10th, we met the new Commandant of the Marine Corps, General James F. Amos, spoke to him for a few moments about our mission, exchanged challenge coins, and had a picture taken. 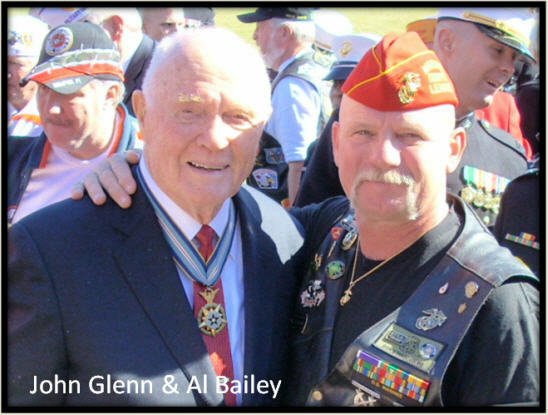 In addition, we met the Guest Speaker, former Ohio Senator, Astronaut, and USMC Fighter Pilot Col. John Glenn. We then stopped by for a brief visit at the 2/9 Organization, which meets annually in Washington, DC. We ended our day with a visit to the Vietnam Memorial Wall, where we left the 2010 Challenge Coin beneath the "Last 41" names, made a Crown Royal toast, and said a prayer. If you have not yet visited "The Wall", you should make every effort to do so. News from the National Museum of the Marine Corp in Quantico Virginia: While they are unable to commit 100%, the curator is excited about our recent donations of items from Koh Tang. Curator Jennifer Castro and members of her staff identified that the next addition to the museum will be the Post Vietnam Era. They plan on a Koh Tang/ Mayaguez display to start off their timeline. They seem very sincere and optimistic about this, but timing depends on their funding. Construction could begin in a few months, or it could be a year or two. Unfortunately, the Quantico Museum could not commit to taking the SS Mayaguez Captain's desk and bunk. We are again working on possible options for placing these historical items, and will provide more information as it becomes available. If anyone has any ideas for this or has any items they feel the museum might be able to use, please contact me. Thank you to our Vice President Dan Darden for sending out Christmas cards to our entire mailing list. This small gesture shows we are growing as an organization. Dan also would like to remind you of your upcoming birthday by sending you a birthday card, but first you need to provide him with the month you were born. E-mail Dan at vetsbuildit2@aol.com or give him a call on (706) 716-0284. I cannot go without thanking Tina and Al Bailey for the fantastic newsletter they just produced. In my 30 plus years of community service work with numerous organizations, I can easily say it is the best newsletter I have ever seen. If you have a chance, give Tina and Al a call to let them know how much we appreciate them. This will also give you guys a chance for payback for all the times Al called you at 3 AM. Make your reservations for the 2011 Campfire Gathering/Golf Scramble fundraiser in Odon, Indiana, which is July 30 through August 7. Camping is not a requirement (hotels nearby), nor is being a golfer. We always have a great time, which makes the week go by way too fast. The dates coincide with the town of Odon's 126th Old Settlers parade. Check out www.odonoldsettlers.com for a schedule of events. As always, if any of you are having any issues with PTSD or Veterans benefits, please feel free to call me. Best wishes for the New Year, peace, and happiness to you my brothers. Much has happened since our big reunion in May. I was waiting to get final answers on some things before I sent this memo, but much is going on, so I will share what is happening now and follow up in the near future with more information. First, the good news: Since the reunion I have spoken to more than 10 of our brothers who are now "in the door" with the VA and in the process of getting the Veterans Benefits they justly deserve. At least another half dozen of our guys who were getting some benefits are now receiving an increase in their disability benefits. As always, if I can assist you in the process of getting your VA benefits, call me anytime. 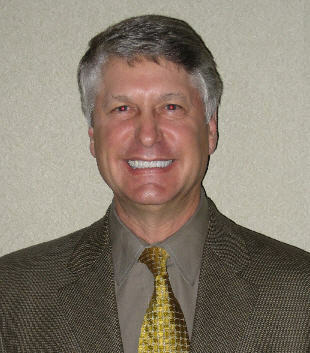 Many of you have met Don Miller of Columbia, SC. Don is a former SeaLand/Maresk employee and was instrumental in getting our organization some serious funding when we were just starting out. At the recent Branson reunion, Don won over $300.00 in the 50/50 raffle and immediately, generously, donated it all back to our organization. 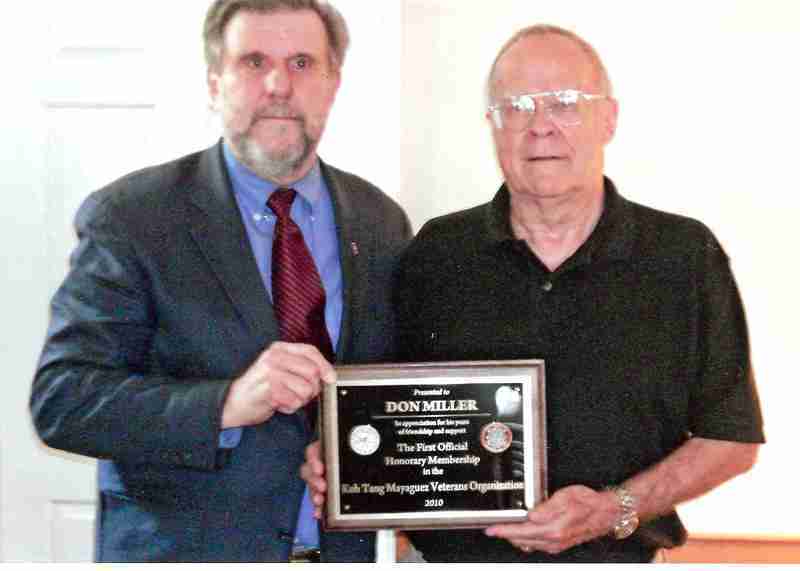 Although Don was very proud to be an Associate Member of the Koh Tang Mayaguez Veterans Organization, our Board of Directors unanimously voted to honor Don as our First Official Honorary Member. Author Scott Baron's new book, "Valor on Koh Tang Island and the Recovery of the Mayaguez," is set for publication this spring by the Naval Institute Press. Several of our brothers are major contributors to this book, which for the first time looks at our battle from the perspective of the Marines on the ground. It is very well written and shows us in a very favorable light. Details on the upcoming publication will be announced soon. Work continues on the placement of the Captains Desk and Bunk from the SS Mayaguez. 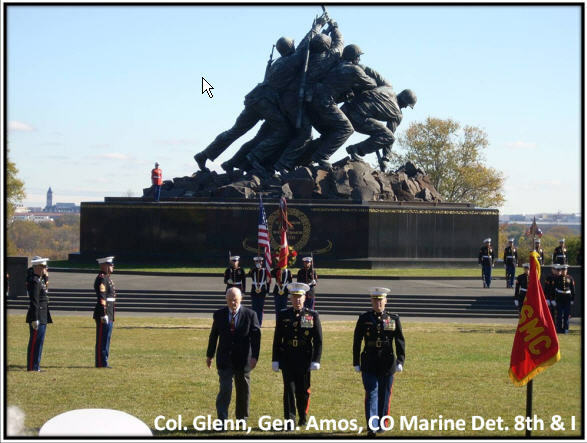 The National Museum of the Marine Corps in Quantico, VA, is in the initial stages of discussions. Hopefully, a display at the museum is in the works. If the museum does not go ahead with the exhibit, we will have a backup plan. Have you checked out kohtang.org? (Not our site, kohtang.com.) It seems some Chinese investors want to turn our little island into a resort with condos and highways. Many of us are extremely concerned that those carrying out construction on Koh Tang might ignore any remains they uncover, especially those of our brothers who have not yet come home. JAPAC in Hawaii has been notified, I will keep you informed on this very sensitive issue. Tom Noble is working hard on our 3rd Annual Golf Scramble (6 Aug 2011) which raises money for the Ronnie Hughes Fund. This is a weeklong campfire gathering. Check-out the flyers on the website for more information. Finally, I'm pleased to announce that on November 6 we will be celebrating the Marine Birthday Ball at the Gregory S. Copenhaver Marine Corps League Detachment in Elkton, MD. The league is named after our brother Gregory S. Copenhaver, whose remains were repatriated in 1995 from the wreckage of Knife 31 on East Beach. Joining us at the Birthday Ball will be members of L/Cpl Copenhaver's family. We invite you to attend. You will find information about the Birthday Ball on this site under the icon What's New! The 35th Anniversary Reunion of the Mayaguez - Koh Tang Veterans was a major success and our best reunion, so far. More than 60 veterans from the USMC, USN, USAF, Sealand and support elements, along with many family members and friends attended. We had 81 people at our banquet. Many thanks to the dedicated board members who worked so hard to make this possible, but especially Al and Tina Bailey, Fred and Ellen Morris and Tom and Shelba Noble for their hard work. We started off Thursday night with a Welcome Aboard Party where friendships were renewed and newly made. We had our usual Crown Royal toasts. On Friday we had a very special Open Discussion, Time-line Mission De-brief of the events of May 15, 1975. It lasted over three hours. The group participation was fantastic and emotional as most of our guys became involved relating their personal memories as they learned the details of the operation. At the Neal McCoy Show that night, our group was significantly recognized by the country star. We took pictures and gave him a coin after the show. Saturday was a busy day starting with a VA Benefits and PTSD Seminar. Hopefully with this information more of our guys will get the benefits they deserve. Our officially sanctioned VFW Meeting was strongly attended and 5 new members and 9 new Life Members were sworn in. We are unique in being able to have this meeting with our VFW being in Cambodia. Minutes of the meeting will be posted on our web site later. That afternoon, we held our official reunion meeting. Much was accomplished for the good of our organization. 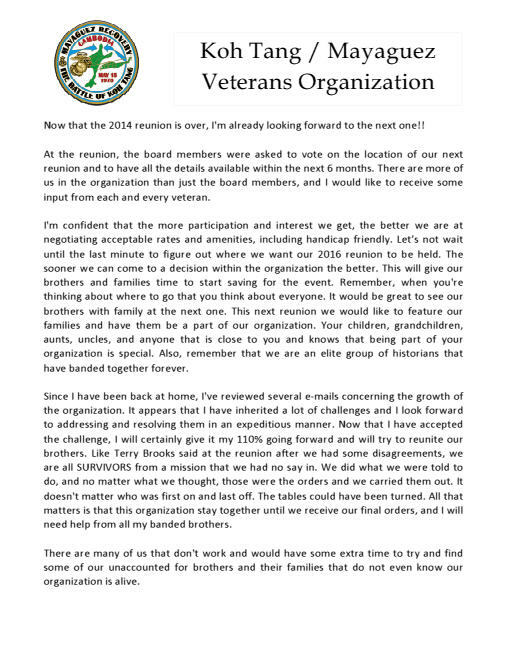 We officially changed the name of our organization to The Koh Tang Mayaguez Veterans Organization. We started out as the Beach Club but wanted to be more inclusive, especially for the Delta 1/4 Marines and more who were involved in support of the operation. We approved a set of By-Laws, and elected a new slate of officers and Board Members. We also voted to hold our 2012 Reunion again in Branson, MO. Mark your calendars now for the 1st part of May, 2012. Dates TBA, We also plan to have another campout and Golf Outing in Indiana in summer of 2011. Watch for more information soon at http://kohtang.com and for a listing of the new Officers and a posting of the minutes of our meeting. For all those who were able to attend this year, especially those who joined us for the first time, it was a truly memorable experience. To those who could not join us, you were missed. No room for all I would like to say. I am honored and proud to be your new president. I plan on having a Presidents Comments section somewhere on the webpage. I look forward to your comments and future participation. Here's to a great Reunion and to improving our organization with increased involvement.